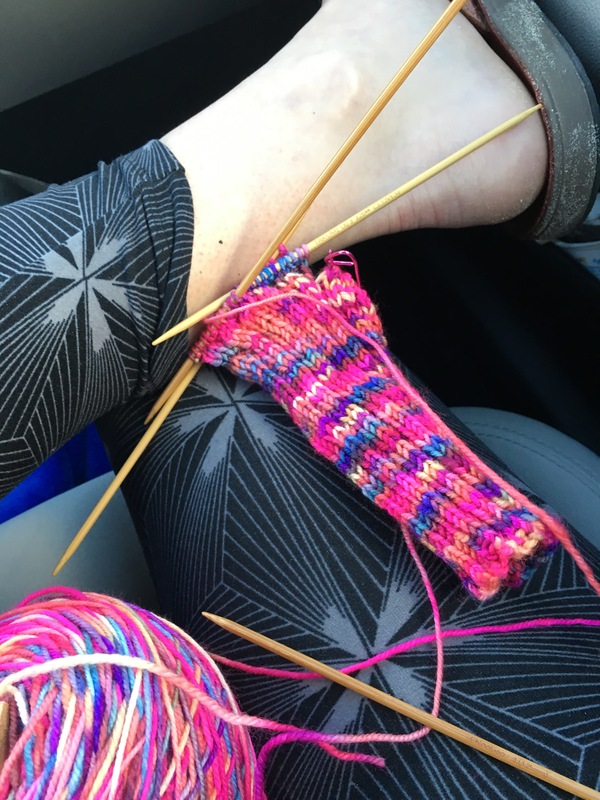 You detail oriented readers might have perused yesterday’s post and left wondering, “Johanna, if you knit those tiny pirates on the way BACK from New Orleans what did you do on the way to Mardi Gras?” (No one wondered about that, did they?) Well readers, I have an answer for you. The first leg was spent completing fingerless mitts for Afthead Junior in the perfectly named “Carnaval” colorway. Afthead Junior has always been a lover of fingerless hand garments. 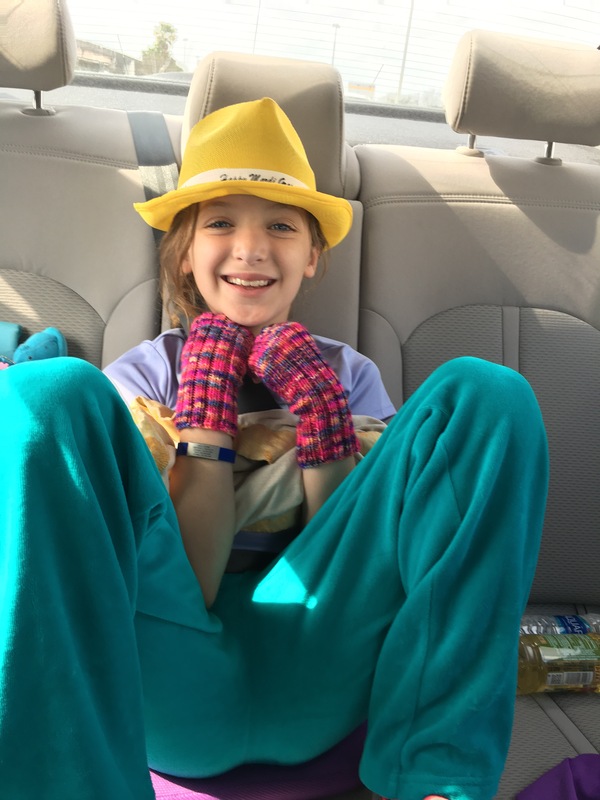 Her allowance has been spent on an array of neither practical or comfortable colored Party City fishnet glovelike creations ranging from wristlets to full arm length wonders. 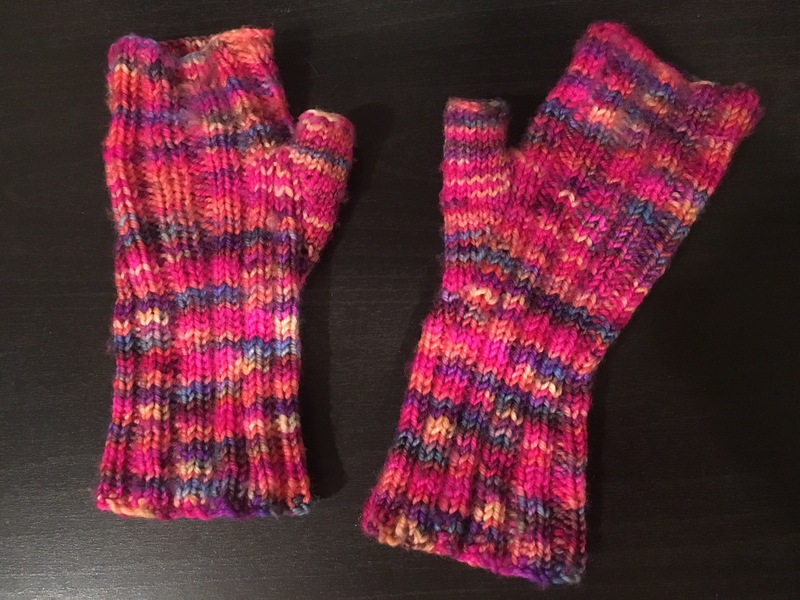 Thus when one of my knitting friends knit her daughter fingerless gloves my daughter begged for a matching pair of her own. I finished the knitting as we battled traffic heading into New Orleans. I wanted to her to have them in case it was cold at a night parade. They would be perfect for catching – fingers free – and the bold colors would attract the attention of the krewe on the floats. However, the weather in New Orleans was beautiful, so I was able to weave in loose ends before my daughter wore them for our not-cold-at-all five hour drive to Houston. Aren’t they adorable with her Mardi Gras hat? Thankfully we still have plenty of winterish weather to come at home, so they will get used. For the knitters, here are some details about the project. Yarn: Manos del Uruguay Allegria, colorway Carnaval. This is a great pattern, and a wonderful yarn. Afthead Junior is really sensitive to itchy yarns, and she loves these mitts. 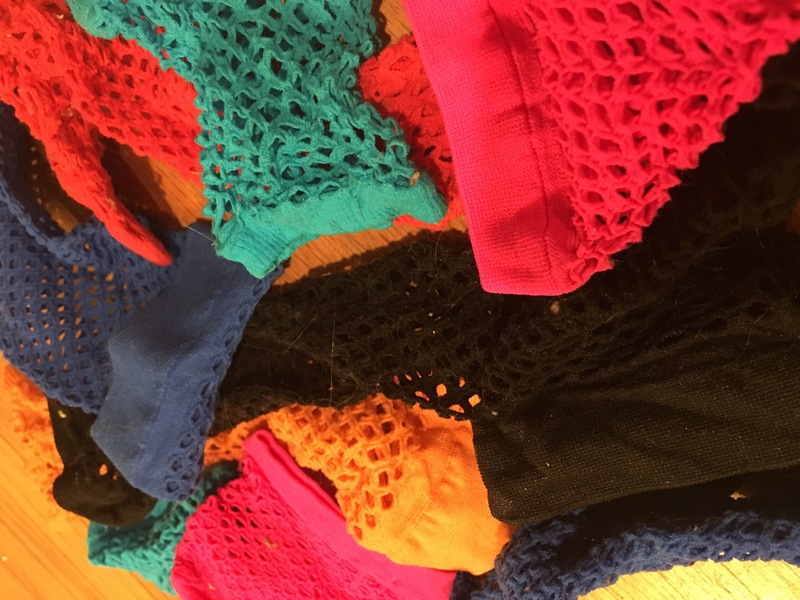 Super bonus for parents, the end product is machine washable. The colorway is beautiful, bright and eye catching. I recommend these for anyone looking for a quick functional knit for kids. Plus, I’ve got enough yarn left that I’m casting on a pair of socks for myself out of the same skein. Silly kitty! I love the fingerless gloves. I have a couple pair myself and they are so useful. 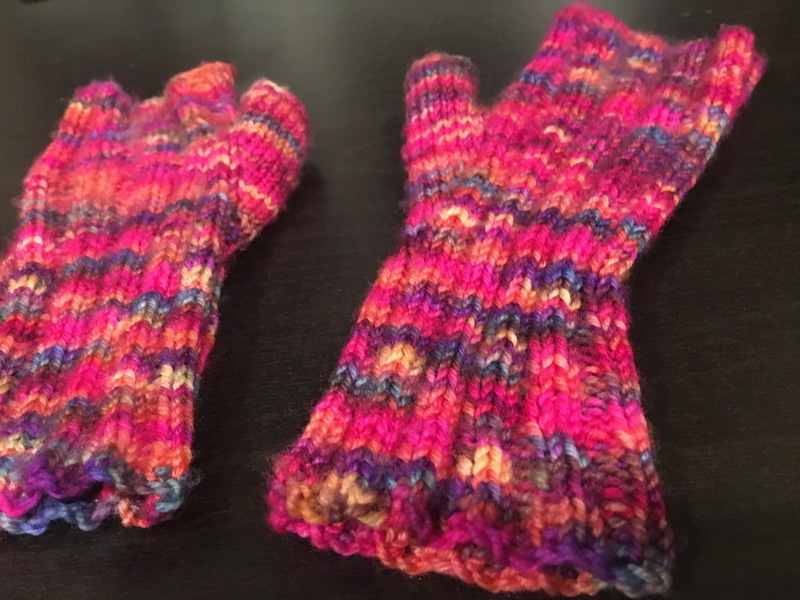 I’ve made fingerless gloves for my mom and my kid now. I think maybe momma needs a pair for herself? After the socks are done? Oh, that cat! Pulling yarn out of her was so gross and she was just chewing away at it like she was determined to eat the whole darn ball. You definitely need a pair. 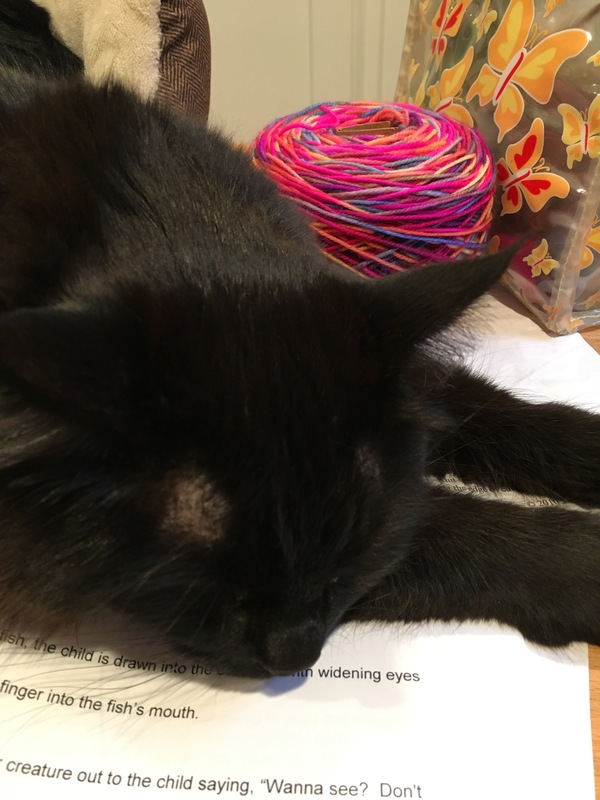 I’ve had cats that try to eat yarn too. So gross pulling it out! Ha, just found this old comment and it made me giggle. Afthead junior also trends toward dreadlocks, so she’s set if the 80s ever gets combined with 90s grunge style.